Don's Dimensional Shift: Soulmates is now on Kindle Unlimited! 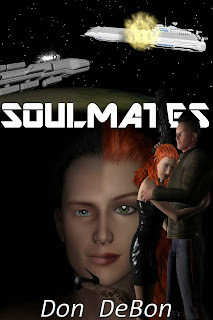 Soulmates is now on Kindle Unlimited! 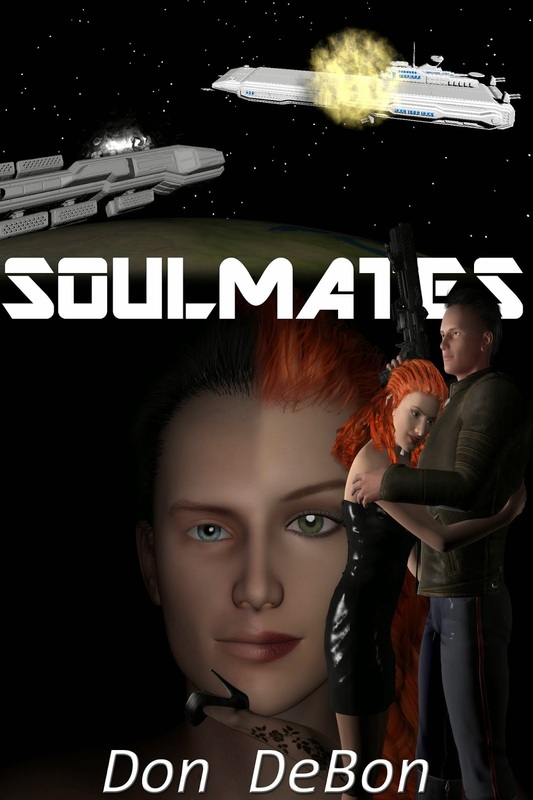 I am pleased to announce that Soulmates is now on Kindle Unlimited. And of course if you don't have Kindle Unlimited, it is still available for only .99 Or if you prefer paper, it is still out in print editions at Amazon, Barnes and Noble, or can be ordered by your local book store. Mechands . . . everyone has one. The metal race built by man to serve our every need. But Aleshia is about to find out they are not the benevolent protectors that she has always been taught. And who is this strange man in her dreams? A man who actually exists and reveals the whole world is not as she thought. The holo projector building shook as raw power flowed into the dish. Building exponentially until a large beam shot up out of the center and hit the Mechand ship head on, blasting right though the middle section. Time seemed to stand still as the beam rapidly increased in size until it was the full size of the building. The ship hovered helplessly as if speared through the heart. Then the beam grew in size again into a full conical blast that totally engulfed the ship. Fire buried from the inside out in a ever expanding plume of destruction until it disintegrated as though it never existed. "Wow." Aleshia muttered under her breath. The building shook again but this time for a different reason. The automated voice boomed over the speakers. "Warning this facility will overload in two minutes. All personnel must evacuate immediately!" Deven grabbed Aleshia's hand. "Time to go!" He said pulling her out of the building and towards her car. The projector dish shook again, which reverberated out to the other buildings. Signs and porches began to fall off. Glass windows exploded under the strain. Aleshia looked up and saw different cars, large heavy lifting construction vehicles, and cargo haulers ascend into the sky and disappear like fireflies into the night as they engaged their overdrives. The ground's ever increasing movement made it impossible to run by the time they reached Aleshia's car. Deven hopped into the drivers seat. "I am driving." But the car refused to power on. Aleshia pulled him out of the seat. "No I am! The car is keyed to me, get in!" She shouted pushing a button that popped the passenger door open as a building fell behind them. "Okay you don't have to tell me twice!" He said hopping into the passenger side, while she fired up the engine. A moment later they were hovering up out of the complex. "Um I don't mean to be pushy, but can this thing go any faster?" "It is safer if I let the engine warm up a little before I apply full thrust." "Look in a few seconds, if we are not away from here, we won't have to worry about anything ever again!" Aleshia's eyes widened. "You mean ... wait a sec how big of a blast is that thing going to put out?" "I don't know, and I don't want to be anywhere around to find out okay? So PUNCH IT!" Aleshia nodded and hit overdrive dialing it to maximum. They were slammed back into their seats with the sudden acceleration. Just as the center holo projector reached critical mass. Immediately it exploded in a ever enlarging fireball. Microseconds later it engulfed the entire complex and continued to expand. Fire lashed out at them, but they were just beyond range. Red hot lava broke though the surface incinerating anything not already blasted and burnt beyond recognition. Several large jets of lava shot up over two thousand feet into the sky with the pressure fully released, then came back to earth as large solidified rock A new volcano was born.